South African trumpeter Hugh Masekela will probably be forever remembered for his one major pop hit, the cheery instrumental "Grazing in the Grass". The cowbell-infused period instrumental, not to mention the kitschy vocal remake by the Friends of Distinction, would suggest that Masekela's career was dedicated to feel-good pop instrumentals infused with just a hint of "exotic" African influence. Perhaps others will remember his collaborations with Miriam Makeba, and his groundbreaking early albums that helped bring traditional South African music to the mainstream jazz audience. Of course, those with an eye for international politics will remember him as one of the leading crusaders against apartheid. Whatever one's preconception of Hugh Masekela, the new compilation Still Grazing will challenge it. Still Grazing is not a greatest hits album, cherry-picking the most popular (or even best) tracks from Masekela's career into one convenient introduction. 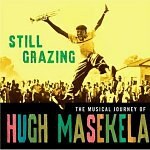 Still Grazing is the soundtrack to Masekela's recent autobiography of the same name, designed to give consumers a taste of Hugh Masekela, the musician, while his book gives them an impression of Hugh Masekela, the man. Stewart Levine, Masekela's longtime producer, was asked to compile the songs he thought would best represent Masekela. Levine's decided to focus exclusively on Masekela's work from the '60s and the early '70s, picking some obvious favorites (including, by necessity, the pop hits "Grazing in the Grass" and "Up, Up, and Away"), as well as some nearly forgotten songs. Still Grazing fails as a comprehensive collection, but it does provide what the album's subtitle suggests: a true "musical journey" through a variety of styles. By not focusing on "hits", or even fan favorites, this new compilation is able to establish Hugh Masekela as not just a "world music pioneer", but as a highly experimental musician breaking down genre barriers and occasionally eschewing the concept of genre altogether. The opening track, "Child of the Earth", sets the tone for the whole compilation. It opens with a dark, conga-influenced groove which adds a bewitching background for Hugh Masekela's nearly spoken-word lyrics. Masekela's trumpet playing itself only emerges in the song's last few seconds during a lonely solo that fades out almost as soon as it begins. It is entrancing, and a little frightening, and entirely unclassifiable. Truly, it has its roots in South African music, and the rhythm is influenced by mid-'60s R&B, but the combination creates something totally unique. Levine apparently enjoys Masekela's numerous attempts to merge spoken word with R&B and South African flavored jazz. In fact, most of the collection's eleven tracks focus as much on Masekela's voice as his widely praised trumpet-playing (which, nevertheless, is beautifully showcased on the extended straight jazz take on Antonio Carlos Jobim's "Felicidade"). Levine's dedication to Masekela's often overlooked vocals makes sense considering that this album is supposed to be a supplement to Masekela's autobiography. This is Masekela's story, told in his own voice. Thankfully, Masekela has a commanding vocal presence that sounds triumphant on African numbers like the classic chant "Ha Lese Le Di Khanna" and the Fela Kuti-inspired "Languta". On the English-language tracks, his deep voice is the perfect counterpoint to his bold, colorful trumpet playing; it acts as a deep, earthy presence that grounds the tracks in everyday reality. The two most impressive tracks, "Gold" and "Mace and Grenades", come from Masekela's 1968 release Masekela, an unsettling and unpopular album that alienated much of the fan base he had won with "Grazing in the Grass". In the liner notes, Levine defends his choice for representing this album at the expense of some of his more popular releases with a comment that "both Masekela and I thought they should be heard". A single listen to these selections will show that Levine's defense is entirely unnecessary. These songs, like "Child of the Universe", are song-poems of a sort, but deeply troubling sound poems where even Masekela's trumpet sounds more ominous than bright. In 1968, apocalypse was in the air, and these tracks document that turbulence. On "Gold" the usually precise rhythm section goes off balance, as if the backing tapes were malfunctioning, while Masekela speaks, sings, and shouts about the difference between "diamonds" and "gold" and "stones". The song is clearly an allegory -- PopMatters writer Kandia Crazy Horse made the connection between it and the closing "Stimela (Coal Train)" about poverty-stricken South African blacks forced to toil in Johannesburg mines -- but it is so insular that the message of racial and economic injustice becomes opaque. It's almost as if when he recorded the song, life was becoming too confusing and oppressive for simple, direct statements. "Mace and Grenades" is more explicit about this oppression, ending with the painful realization that jail would be preferable than modern reality. His vocals are so anguished and forceful that it sounds like Masekela's voice itself is imprisoned, trapped within the confines of the English language. The riveting selections from Masekela, as well as "Been Such a Long Time Gone", a sorrowful vision of the South African homeland Masekela could not yet return to, provide the only occasions when the songs actually act as a musical autobiography. The album really is more like a long anecdote, about a certain time period, jumping around from digression to digression. This approach may be a little incoherent, and somewhat unsatisfying, but ultimately Still Grazing should be commended for highlighting some forgotten paths Masekela took during his long musical journey.